Established in the year 1998, Kamlavtar Fashion has earned a valued name in the field of fashion as a manufacturer, supplier and wholesaler of fabulous collection of Designer Suits, Ladies Tops, Kurties, Kameez. Our offered range is distinguish by trend setting designs and is widely patronized by the customers across varied locations in the country. Our products are crafted using best possible quality materials and are in tune with the taste and preference of the customers. We have developed an up to date organization that is outfitted with high-tech weaving and embroidery equipment for enabling smooth operations. For enabling high operational competency, we have divided our organization into numerous different units as designing, manufacturing, sales & marketing, logistics and administration. These units are professionally managed by our skillful professionals who perform several roles and responsibilities in the business. These individuals are familiar with the existing market trends and make every effort to attain maximum possible customer satisfaction. Our products are delivered within the fixed time frame and as per the customers’ requirements. Due to all these factors, we have been successful in attaining a wide clientele spread all across the country. Beneath the mentorship of Mr. Deepak Tank, this Jaipur based organization has established a strong grip owing to his vast domain expertise and brilliant leadership. He has integrated strong principles in the organizational culture and has constantly motivated towards highest peaks of success. We are supported by experienced professionals, who direct their effort for providing super quality ladies kurtis and dresses to the customers. Our designing professionals have rich knowledge about the modern fashion trends. Our DUNS No. is 87-043-3850. 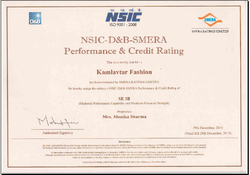 We are certified by NSIC D&B SMERA . NSIC D&B SMERA Rating is a comprehensive assessment of the enterprise taking into considerations the overall financial and non financial performance of the company. SMERA Ratings Limited (formerly SME Rating Agency of India Ltd.) is a joint initiative of Small Industries Development Bank of India (SIDBI), Dun & Bradstreet Information Services India Private Limited (D&B) and leading public and private sector banks in India. We direct all our efforts towards acquiring a strong customer base across the country by providing an assorted gamut of ladies kurtis and dresses. Moreover, we are offering these products at pocket friendly prices. Quality of the offered range of ladies kurtis and dresses is maintained at every product through various quality assurance testing. For this, we have hired a team of quality controllers, which hold expertise in their domain of operation. Moreover, we have established a huge in-house quality checking unit to ensure that the superior quality of the offered range is never compromised. For the purpose of designing high quality array, we have established a modern infrastructure unit. Equipped with latest machines and designing mills, our top notch infrastructure is known for carrying out standardized operation. Our infrastructure consists of manufacturing, designing, warehousing, packaging and testing departments.